Sun Rays are Sun Microsystems (now Oracle) thin clients and they basically consist of a Sun Ray server (which is actually not a particular type of hardware but a piece of software which can run on various platforms. In this article Sun Ray server will refer to both the machine and the software, the context should make it clear.) and the respective Sun Ray clients (which used to be a particular device which came in various flavours and later was complemented by a soft client in order to give e.g. notebook or tablet users a virtual option). When users are logging into the Sun Ray server the respective entries in utmpx and wtmpx need to be created and there is a distinction between logins coming from a Sun Ray client (hard or soft) or other sources (e.g. console or remote logins). In the next two articles I will take a deeper look into the wtmpx entries created by Sun Ray clients. When looking at the members of 'struct futmpx' in /usr/include/utmpx.h there are two entries which identify a Sun Ray client login. FIrst of all ut_line is set to dtlocal and secondly the ut_host entry contains the name of the DISPLAY i.e. a colon and a number e.g. ':21'. An entry in wtmpx is created for each login but also for each logout action. Aside from user name, date and time etc. the login entry is identified by ut_type being set to 7 (USER_PROCESS) and the corresponding logout enty has ut_type set to 8. Here is the example of a login/logout pair of lines for user 'joes' but of course these lines are not adjacent since many more entries have been happening after the login (the example is the output as shown by fwtmp). i.e. user 'joes' logged in on Nov 28 with process id 40881 and his DISPLAY was assigned ':21'. He logged out again about one month later. There are a couple of cases when no corresponding logout entry can be found in wtmpx: the server crashed unexpectedly (quite rare) or the admins have set up regular backup and re-init of wtmpx files (very often retained as wtmpx.1, wtmpx.2 a.s.o.) so the login entry would be in another file than the logout entry. The code in this article will assume that corresponding login/logout pairs can be found in one file. My code will now scan wtmpx for all login/logout pairs of Sun Ray entries and create a data file which can be used by gnuplot to visualize the findings. 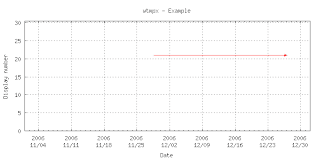 The graph will show the timeline on the x-axis and the DISPLAY numbers on the y-axis. A login/logout pair will be represented by a vector which starts at login time and ends at logout time, the length of the vector being the duration of the session. The example above does look like this. set style arrow 1 head filled size screen 0.01,20,65 ls 1 lc rgb "red"
Almost the same code will be used to create the graphs for many user sessions over a longer period of time. it stores login entries in some data structures. When a corresponding logout entry is found a line of data is printed. When a system reboot entry is found all currently stored login entries will transformed into data using the reboot time as the time of logout for all entries. After having read the complete wtmpx file the remaining login entries correspond to sessions which are still active. They will be transformed into data lines too. With data files now in place it's time to create some graphs in the next blog.